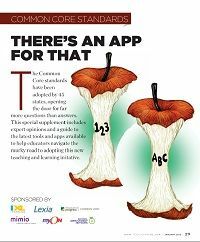 The Common Core Standards - There's an App for That! The Common Core standards have been adopted by 45 states, opening the door for far more questions than answers. This special supplement includes expert opinions and a guide to the latest tools and apps available to help educators navigate the murky road to adopting this new teaching and learning initiative.